1. 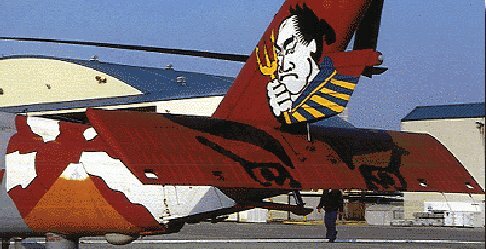 The new Hasegawa 1:72 SH-60B Seahawk #DT144 Warlords Special has the tail boom section decorated with stunning artwork representing Mt. Fuji, the Rising Sun, and a Samurai warrior. I don't know if this release is going to be available outside Japan, but you can certainly get it from Hobbylink Japan or Rainbow Ten for 1200 Yen. 2. The Shanghai Dragon 1999 catalogue in the USA is substantially different from that included with the Italeri catalogue in Britain, and includes many items labelled "Not available in Europe". These include reissues of ALL the DML 1:35 OH-6/MD-500/530 variants, as well as the separately-boxed Loach crew figures. 3. I'm already beginning to have serious doubts about the alleged Tac Scale Dynamics 1:48 Lynx and H-21 reported last week. An email to Cam Decals, owners of the Tac Scale line, was forwarded without significant comment to Sentai their distributors, who replied that they have no knowledge of them. Scale Aviation Modeller Intl. have yet to respond to my enquiries as to where they got the information from. 4. Sources within Revell have denied any intention to kit the EH.101. The rumour appears to have originated from a well-repected figure on the UK modelling scene after a meeting with senior people from Revell, so you'll just have to make up your own minds what's going on here ! 5. Cobra Company have a nice new website with pictures of all their products. 6. The Pavla 1:72 resin Ka-50 cockpit set is a blatant copy of the Parade Miniatures product, but the newer Mi-24 sets (HKN #32) appear to be original. 7. The Yumtk/Interavia product listing at Tushino Aviapress includes a new line - etched brass parts, including sets for the Ka-50 and Mi-24, priced at $4.95 apiece. 8. Airwaves have released a 1:72 white metal flotation kit, #72-095, for the Airfix Westland Scout as used by British forces in Hong Kong. I was under the impression that this was released some two years ago under the number 72-090 (see Airwaves advert on p.202 of Scale Aircraft Modelling, June 1997), but that number now seems to belong to something else entirely. Confused ? Me too. Also from Airwaves is a 1:72 set of two AS-12 missiles, pylons, and launch rails suitable for the Wasp and the Wessex. The missiles are resin, the rest is white metal. Set #72-102. 9. A limited run of decal sheets of Finnish subjects is being made by the IPMS UK Finnish Aircraft SIG under the name GALdecal. The first sheet will include insignia and serials for the Mi-4 and Mi-8 in Finnish service. If these are a success there will be more to follow, possibly including some Swedish helicopter subjects. If you have any suggestions, preferably with supporting material, please send them to George Lowe, 22 Gowanhill Gardens, Stirling, FK8 1SG, Scotland. Thanks to Tony Morgan, Ted Burnett, Chris Miller, Frank Herkenhoff, Pete Tasker, and Guy Holroyd.